Digital disruption is bringing the Mass Media Era to an end. Now what? In the midst of major change, we can only make the right moves if we properly understand what’s happening. Right now, we in the mass media are wrestling with the most massive change we’ve ever seen. But, as in the parable of the blind men and the elephant, we’re only aware of the tiny part of this change that we touch every day. The change is vastly bigger, much farther-reaching and much longer lasting than we realize. We need to see the whole picture to understand what to do about it. Seen in its true scope, this is the largest change in human history. It’s sweeping the planet, and we’re only in the early stages of it. It will continue through this century and beyond, forever changing the fabric of daily human life, the dynamics of individual fulfillment, productivity and freedom, and the structures of government, society, business and the economy. A couple of years ago, trying to puzzle out what was happening to the newspaper industry, I spent an afternoon trying to diagram the change. I could see that our business was being affected by a massive change in the availability of information, and I felt a need to work out a model to describe it. The drawing below was the result. The green pipe represents the sum total of human information. From left to right is the span of human existence, beginning with the origins of homo sapiens 200,000 years ago. At the left, the information pipe is tiny; at the right — in the present — it expands quickly to infinity. The pipe was tiny for almost all of those 200,000 years. There was virtually no information — only what people could learn by experience and pass along by word of mouth. Then came writing, and then printing. Then, in barely the blink of an eye, came affordable books, magazines and newspapers, followed even more quickly by radio and television. And then, in the mid 1990s, came the Internet and the World Wide Web. That change has been rapidly driving the difficulty and cost of transmitting and receiving information toward zero and quickly expanding the pipe and its contents toward infinity. There are three main sections in the chart. At the left is the pre-media era — lasting many thousands of years — when information moved from few to few. 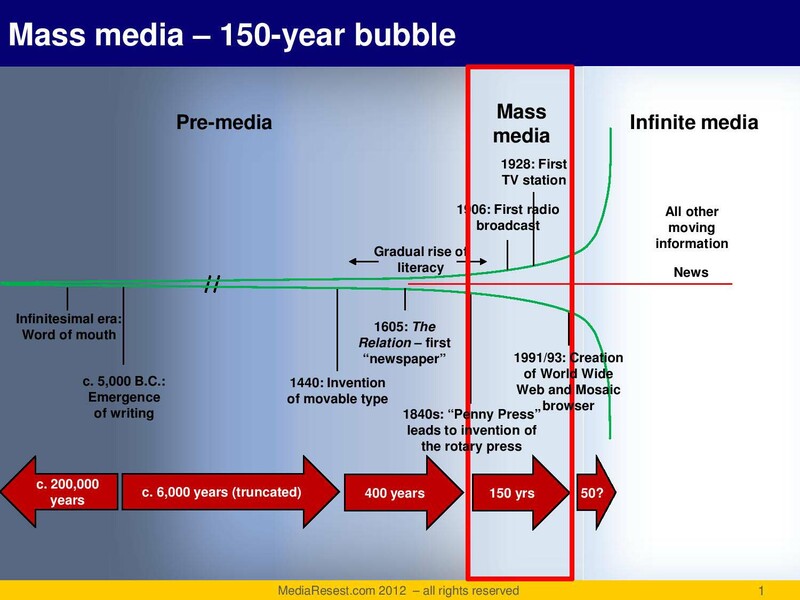 Then comes the mass media period of only 150 years, when information moved from few to many. And that era is now being supplanted by the era of many to many, which will last for all time to come. Let’s put it in individual human terms. For 200,000 years, you could get hardly any information about anything. For 150 years, you could get whatever someone decided to print or broadcast. And now, from about the year 2000 on, you can get just about any information you want, from just about any source, wherever you happen to be. That brief transition period between “few to few” and “many to many” was the home territory of every mass media business model. And it was barely the blink of an eye. To illustrate: If the 200,000 years ending in 2000 were just one day, the 150 years of the mass media would be the last 1.08 minutes before midnight. And the next day would be another 200,000 years in which everyone can get any information from anywhere. Before the 19th century, no mass media business models existed. During the 150-year bubble, the mass-media business models bloomed and dominated. All audiences had to come to mass-media enterprises to get the information they needed to live, work and do business. And virtually all businesses had to come to mass-media enterprises for advertising to reach those audiences to sell goods and services. As the bubble ends, the mass media are becoming just a tiny percentage of the vast amount of information available, and just a few of the infinite number of ways for businesses to reach individuals. The advertising business model has shrunk by half in less than 10 years. In this change, the mass-media models that have been so big are doomed to become very small. Directories went first, lost amid the ease and universality of web search. Newspapers have been going almost as quickly, as the Internet rapidly gained enough bandwidth to handle text and pictures. Radio and television will go next, as internet bandwidth and speeds rise to the point where audio and video can be handled easily. All of this will take a lifetime at most. No force on earth can stop the process that is swamping the old mass-media business models. This will force us to rethink absolutely every aspect of the media businesses we’ve known. From the global perspective, this is the best thing that has ever happened to humanity. The human mind is, fundamentally, an engine for processing information and producing choices, decisions and actions. For that mental engine, most of the last 200,000 years have truly been the dark ages. It has been a long, confining period in which only a tiny number of humans could get enough information and knowledge to maximize their life potential. Now, as information and access expand to infinity around the globe, humans will be able to learn, to see and understand the opportunities that others enjoy, and to strive to maximize their own abilities and opportunities. The increase in human capacity, productivity and fulfillment will be monumental. For those of us in the mass media, however, these are times when we will be forced to reinvent the nature of our service to humanity or be run over. The exclusivity we have enjoyed — and which has made us extremely profitable — is fast disappearing. News is now just a tiny part of the vast ocean of information available for people to consume, and advertising is now spreading out across that entire vast ocean of content — and this will only get worse. Harvard professor John Kotter says businesses fail to make necessary transformations because they fail to grasp and communicate the urgency of the need. There can be few business situations more urgent than the one today’s mass media organizations face. To survive and prosper, we must meet new needs. Most of us in the mass media industry are local businesses — specialists in serving geographic communities of individuals and businesses. But we are now in competition with everything on the internet — cat videos, Facebook games, tweets, Instagram photos and so much, much more. And all of those are competing for the ad dollars that used to be ours. Here’s the question as I see it: On a planet where everyone can get virtually any information, what new models can we discover for engaging their attention, for being indispensable, for supplying information they aren’t willing to live without? And how can we help businesses take advantage of the vast new range of audience-reaching channels and technologies — whether we own them or not — that are penetrating every waking moment of human consciousness? And get paid for it? Innovators outside the media industry are asking themselves the same questions, and they’re coming up with answers too numerous to count. Where was Facebook 10 years ago? Where were Pinterest and Instagram four years ago? Even as we fight to extend our mass-media business models as long as we can, we must be forging into the new frontiers of service to the people and businesses of our communities that lie ahead. And we don’t have 200,000 years to figure it out. Posted on December 17, 2013, in Advertising, Audience, circulation, Content, Disruption, innovation, investment, Magazines, Media business model, Revenue, Sales and tagged advertising, mass media, media business model, media disruption. Bookmark the permalink. 2 Comments. As the world’s information pipe expands to infinity, consumer behaviors are changing fast, and the old media business models are breaking down. Steve Gray (see "About") blogs on what's happening, why it's happening and what to do about it. Catch up on MediaReset's basic concepts in the three-part "Basics" section below. To be notified of new posts, click the "Follow" button in the lower right corner of your screen. Part III: What about news? In a disrupted industry, how can you future-proof your career?